Day 2 arrived and in typical Scottish fashion- it started of dull and driech. We were up early and cooked breakfast- cant beat a bacon roll. Lynn being a vegetarian, had to make do with an egg roll- she doesnt know what she is missing! We packed up and followed the track east above the south shore of Loch Affric. I’ve read on several occasions that this track is called the Yellow Brick road and we discussed which characters we could be from the Wizard of Oz- apparently I was the Tin Man as Lynn joked that I had no heart! Lynn said she was the Scarecrow in need of a brain! Soon we left the track to climb south initally up the path and over the hill to Cougie. There was a short diversion at the start of this, with a small Hydro scheme in progress of being built, but with other challengers, we soon picked up the path climbing steadily past old pine trees and small waterfalls. We walked up the hill with other challengers emerging onto a track and had a short break, before deciding which was the correct path to take to Cougie- yet more short but steep climbs in the mist! The path turned into a track which joined a forestry track that drops down to Cougie. Lynn got talking to Donna Bairstow- a challenger from the Isle of Man whilst i plodded on ahead and sometimes lagged behind looking to find spots to take decent photos. The track to Cougie seemed to go on forever, but eventually we found the sign for Cougie Lodge and discovered they were laying on refreshments for challengers- I had a bacon roll (again), a bowl of soup and a coffee which was well needed as I was beginning to tire on the last few kilometers of that track. I felt refreshed after all that and we were ready to tackle another climb over the Bealach Feith Na Gamhna to Glen Moriston which was new territory to me. Off we went with Donna and Rob accompanying us up the hill. We found the lovely old track which was steep but very scenic as it wound its way through the old trees. We made good progress up the hill emerging out of the trees high on the hillside where the track soon stopped becoming a good path to start off with. The weather was on our side and we could clearly see the way ahead. From what I had heard the top of this bealach was a walkers nightmare of peat hags, but the path continued to wind its way around the hags although faint in places, we managed to follow it without much of a problem. The path did run out as we started the long descent to Glen Moriston and it was boggy, but we kept close to the river and followed deer tracks most of the way as it wound its way down to the Glen. We took a path down between the forest and the river which made for good going, but as the path went further down, blown down trees made progress harder. Eventually we emerged onto an opening above the single track road on the north side of Glen Morriston. I think all of us had enough for one day and we looked for suitable places to pitch up for the evening. Our camping spot was only 15 meters from the roadside on a lovely grassy spot and only one car passed during our night there. Showers of rain were coming in, so tent was pitched quickly and stove was soon on the go for a cup of coffee and our evening meal. Rob and Donna had set up camp higher up than us on smaller patches of grassy areas and Willie turned up later in the evening having taken a different route over to Glen Moriston- he had been looking for a spot further up the Glen but to no avail and was glad when he had spotted us whilst walking down the road. Our pitch was nearer the roadside than what we would have prefered, but it was the flatest spot I could find for our larger tent. It was a quiet evening and we all slept well. The first day of the challenge was finally upon us. As usual I woke up at silly O clock feeling eager to get those first steps under way. We had stayed in the Trekkers Lodge at the Kintail Lodge Hotel. It was a basic bunkhouse type affair, but clean, tidy and we had a room to ourselves rather than dorm type accomodation. Checking out at the challenge check point wasnt due till 9am, and we took our time getting packed and had a decent breakfast. I was starting to get itchy feet and was keen to get going on our walk. We grabbed our gear and went to have a seat outside in the morning sun to see if there were any other challengers on the go. As it was, there were people milling about and I found out that we didnt have to wait till 9 to check out. The time had come and we donned our packs, had our photos taken before setting off on the path down by Loch Duich where we dipped our feet in the water. Shiel Bridge is certainly one of the more popular starting points and many a challenger seemed to be taking the path by the shore. One of the first people we met and got talking to was Willie Todd- I was quite impressed by his small pack size and the fact that he was wearing trail shoes. Willie was starting his day on a high by traversing Beinn Fhada and camping at the same spot as us- Loch Affric, whilst we took the easier option by walking up the scenic Glen Lichd and over the pass to Glen Affric. 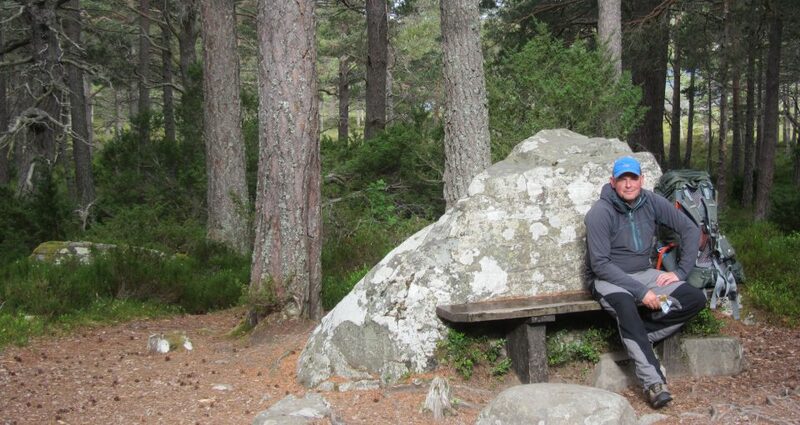 This is a spectacular walk where the path goes up the Glen and climbs up past a gorge winding its way through crags before opening up again as you head into Glen Affric. Eventually we reached Camban Bothy and stopped for a break. It seemed wrong to sit for long in the Bothy as it was a lovely warm day outside, so didnt linger for long. I went to fill my water bottle by the stream near the Bothy, but with all the dry weather lately, it had almost dried up but I still managed to fill it up. I was quite disgusted my all the rubbish which had been left outside one of the Bothy walls- four large bags of rubbish containing items such as gas cannisters to frying pans. There is no refuse collection at Bothies! If you carry it in- you carry it out! We carried on and the path now became a good track to Alltbeithe Youth Hostel- one of the most remote hostels in Scotland- the only way to get there is by foot or bike. The warden was offering drinks and snacks to challengers and I didnt say no to a cup of coffee. We were soon on our way again on the track to Loch Affric where we would camp for the night. Almost 17 miles later we were nearing our destination for the night- the Western shore of Loch Affric, and so were a large number of other challengers. This is a cracking spot for wild camping, one of the best camp spots I’ve had so far. We soon pitched our Scarp 2 tent and as the evening went on, many our challengers turned up for their first nights camp of the challenge. We met Billy Liddel who had set up camp about fifty meters away and chatted away, then Willie turned up also setting up camp. All in all I had lost count of how many people whom had chosen to camp there that evening! It was a beautiful eveing and I wasnt in a hurry to bed down for the night. I took many pictures and had conversations with many people- only problem was that with so many other people in the vicinity, it was hard to find privacy for going to the toilet! Remarkably after such a long day I was still full of energy late on in the evening and eventually I did get into my sleeping bag to get a good nights sleep. A good forecast for the West and I had hatched a plan to walk the remaining four Fisherfield Hills with a couple nights wild camping next to a Loch. Friday morning had arrived and it was just on the turn of the good weather, so everything packed I drove the hundred miles or so to Kinlochewe and parked at the walkers car park at Inchreil which is the normal starting point for walking up landmark Hill Slioch. After much faffing and repacking, I set off from the car about 2pm and pack loaded with all the essentials- I set off along the track up the Glen towards the heights of Kinlochewe headed for Lochan Fada to where I was to wild camp for two nights. The track eventually came to an end up Gleann na Muice, but the path has had a lot of work done to it and it was easy walking heading towards Lochan Fada all the way. As I reached Lochan Fada I met a couple whom were also spending a couple nights camping to walk the hills in the area. I decided on better judgement not to encroach on their secluded spot and walked about ten minutes along the south eastern edge of the Loch to a secluded bay. There I found another Gentleman camping, but this time there was plenty room for both of us and he did not mind me setting up my tent not far away. I set up camp on a slightly sloping damp grassy area, but with views like these- it was perfect and there was a breeze powerful enough to keep the midges at bay so I could sit outside and soak up the evening views. Trout were jumping and splashing in the Loch and when I settled into my tent for the night I could hear a number of rather vocal Grouse calling, but never saw any on the whole of my entire trip. Morning came and it started off with some low cloud, but as I had breakfast and planned out out my day, it started to lift and the sun came out to reveal glorious blue skies. My plan for the day was to walk four different hills, starting with the furthest two outlying ones of A’ Mhaigdean and Rhuadh Stac Mor first getting the pathless walk along the northern shore of Lochan Fada out the way first. The way along the first part of the Loch shore was a pleasure to walk and there was a vague path for the first kilometre or so. After that I decided to start contouring up heading towards the Bealach between Beinn Tarsuinn and A’ Mhaighdean. I saw one deer high on the ridge looking down on me and met several small frogs jumping out the way of my clumsy feet! There was still a decent breeze at this point which I was glad of, but it was getting warmer and I was soon taking my fleece midlayer off to cool down. All was going well. I had reached the bealach at the point between to two hills and now the steep climb up my first hill of the day was to start, and that’s when the problems started. Soon as I started to walk up the steep slopes- I was really struggling. I knew there and then that my plan to bag all four of these hills for the day was not going to happen. I simply wasn’t well enough and didnt have the strength to accomplish this. I havent been very well lately and obviously still not in condition to take on anything really phyisical. What would I do- would I try and carry on and just do the one hill and just take my time? Or would I just give up and head back along the Loch to my camp? Since I was now on the hill and it being such a beautiful day, I decided just to do this one hill and head back the way I came, or see how I felt once I had reached the summit- but I knew that one walking up the one hill was going to be more than enough for me. I made it to the top! Nobody else around on the top of this hill and the views were fantanstic. I was pleased that I had made it and thought this is enough for one day and being sensible to head down after this was the only option. So fustrating with Rhuadh Stac Mor almost within spitting distance away, but even reaching the summit of this remote Munro of A’ Mhaighdean was an achievement in itself. On the way back down the slopes, I met a couple of Hill Runners doing the Fisherfield six from Shenavall Bothy. Lucky them I thought doing all these hills in this weather! The return back along the Loch was hard on my body as I thought it was going to be and I returned to my camp at the small bay satisfied but a little fustrated with myself not being able to do what I have intended to do in the first place- another time soon perhaps! Richard, the Gentleman whom was camping there the previous evening was gone and I had the small Bay to myself for the night. The rest of the afternoon, I took it easy relaxing, drinking coffee and read my book-The Munro’s and Tops by Chris Townsend. After cooking and eating my food, I spent some time chilling and watching the beautiful sunset and it was still a midge free camp, thanks to the lasting cool breeze which kept them away. It had been a warm evening and I slept peacefully with only the tent inner zipped up. I awoke bright and early to bright clear blue skies and was soon packed up and ready for the return journey back to Kinlochewe. Two and a half hours later at 9.45, I was back at the car. On the way back I had met many walkers and mountain bikers heading out for their day on the hills. I was happy to have been out for a couple of nights and had a great wild camping location. I just hope my health improves soon, so I can get back up these hills. One out of four hills was better than nothing!